Be prepared. You've heard that saying over and over. When there is a kayak emergency, hopefully you will have the available resources to help you get out of trouble. And if you say to yourself, I should have brought..... it's too late. There are many methods to help gain attention to your situation. 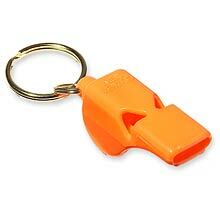 A whistle is an easy, inexpensive way to attract attention. The whistle should be attached to the zipper on your PFD. The whistle should be a ball-less type that works when it gets wet with water. Make 3 loud whistles in a row, wait and then 3 loud whistles. The air horn is small, fits in a PFD and is inexpensive. Make sure it will work when wet. Blast the air horn 3 times in a row, wait and then 3 other blasts. Test out the air horn each year. There are two types of flares - rocket and smoke. Make sure that the expiration date of the flare hasn't expired. Flares are sometimes not 100% reliable, so be prepared for some duds. The rocket flares will only be successful if you can see the people you want to contact. The rocket flares only last for a little while, so if no one sees you during the time that they are lit, you are out of luck. Smoke flares are usually used when someone has already located you and not usually the flare of choice for kayakers. VHF radios are one the best solutions during an emergency as long as there are people within a 5 mile radius that also have a VHF radio turned on. Always be familiar with the mayday steps, channels, etc. using a VHF radio (you might forget when you haven't paddled in a while). VHF radios are now waterproof, small and can fit into a PFD pocket. Always make sure to keep your VHF in your PFD with a short cord attached to the PFD as the radio will not float. A signal mirror is inexpensive and can fit into your PFD pocket. Obviously, if it is not sunny, the signal mirror will not attract anyone. You can stick some reflector tape on the back of your kayak paddles and wave the paddles in the air during an emergency. Obviously, if you have colored paddles (not white), the paddle will be less likely to be seen and if you are in the water, this option might be available. Cell phones will only be useful if there is a connection and if the cell phone is in a waterproof bag that allows you to dial the phone and control all the buttons. There are an assortment of waterproof bags available for cell phones. If you have a GPS, it will be a benefit to give your location to someone when talking on the VHF radio. Be prepared is the first step for signaling help during an emergency.